Moses was an urban planning commissioner of boundless ambition, who created public works that profoundly transformed the cityscape of New York and served as a model —and sometimes a cautionary example—for the nation as a whole. 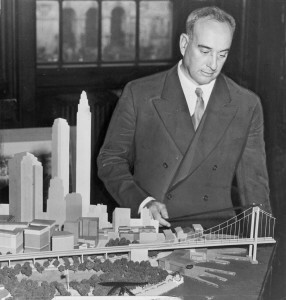 Moses was wholly or partly responsible for some 35 new highways, a dozen bridges, many city parks, the Lincoln Center for the Performing Arts, Shea Stadium, numerous housing projects, two hydroelectric dams, and the entire 1964 New York World’s Fair. He was also a moving force behind the construction of the United Nations headquarters buildings in New York. Widely admired, Moses was also condemned as a megalomaniacal empire builder, who did not scruple at tearing down buildings of historical importance and even entire neighborhoods.